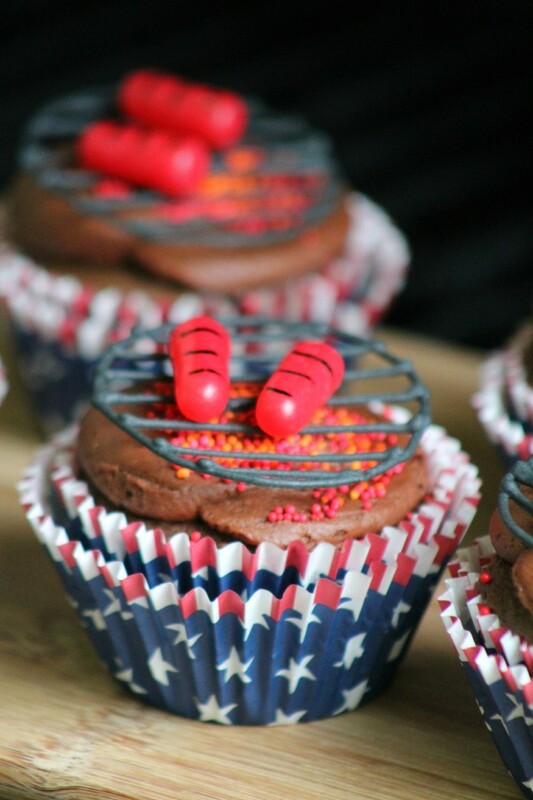 These adorable BBQ Cupcakes with Grilled Hot Dogs really are the perfect cupcakes for memorial day, father’s day, 4th of July, labour day and just about any other summer celebration you can think of! Hey guys! I have the perfect dessert for you over-achievers for just about any summer celebration. Obviously, Memorial Day is here, and BBQ season is already in full force around these parts! Father’s Day is just around the corner along with July 4th! Plus so many people love their Labour Day parties! See? 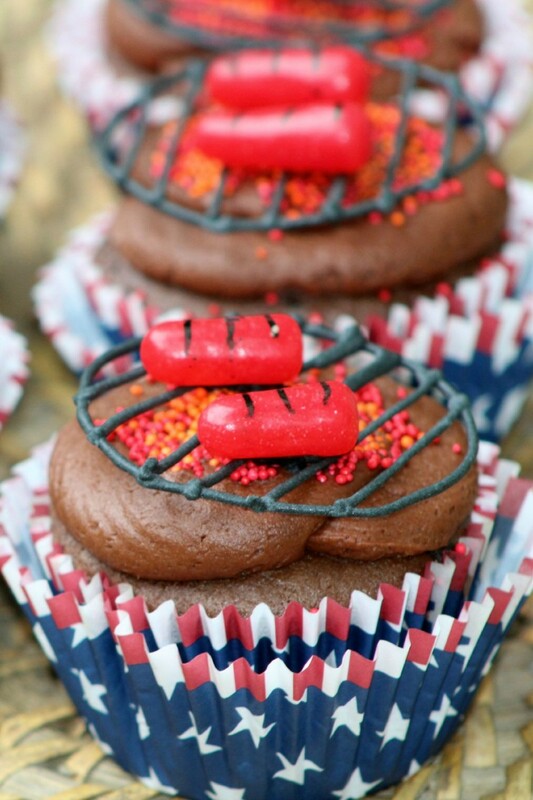 These adorable BBQ Cupcakes with Grilled Hot Dogs really are the perfect cupcakes! -Line cupcake pan with paper liners. -Combine flour, baking soda, salt, and cocoa. -Cream butter with sugar until light and creamy. -Add one egg at a time, beating well after each addition. -Alternate the addition of the dry ingredients and milk with the creamed mixture. -Beat until smooth after each addition. 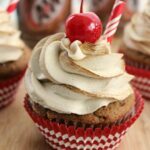 -Scoop batter into lined cupcake tins. -Bake at 350 degrees for 20-25 minutes or until an inserted toothpick comes out clean. 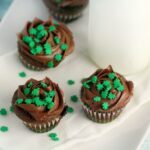 -Cool in cupcake tin for 10 minutes. 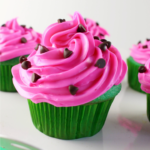 -Remove from cupcake pan and cool on wire rack. -Beat the softened butter until its creamy. -Add cocoa and powder sugar alternately, mixing after each addition. -Mix well… add a small amount of heavy whipping cream after each addition if it doesn’t cream until it becomes creamy. -If the frosting is too thick, add more heavy cream, if too thin, add more powder sugar, a 1/2 C at a time. -Take a large spoonful of frosting, turn the spoon upside down if the frosting stays on the spoon then it is done. If it drops off the spoon add more powdered sugar and mix well. -Spoon the frosting into a pastry bag with a frosting tip. 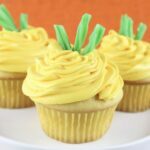 -Frost the cupcakes with a smooth layer of frosting. 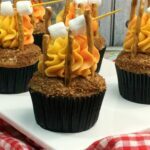 -Using your fingertip dipped into a small dish of water… wet the frosted cupcake to “stick” your red and orange sprinkles to look like flames. 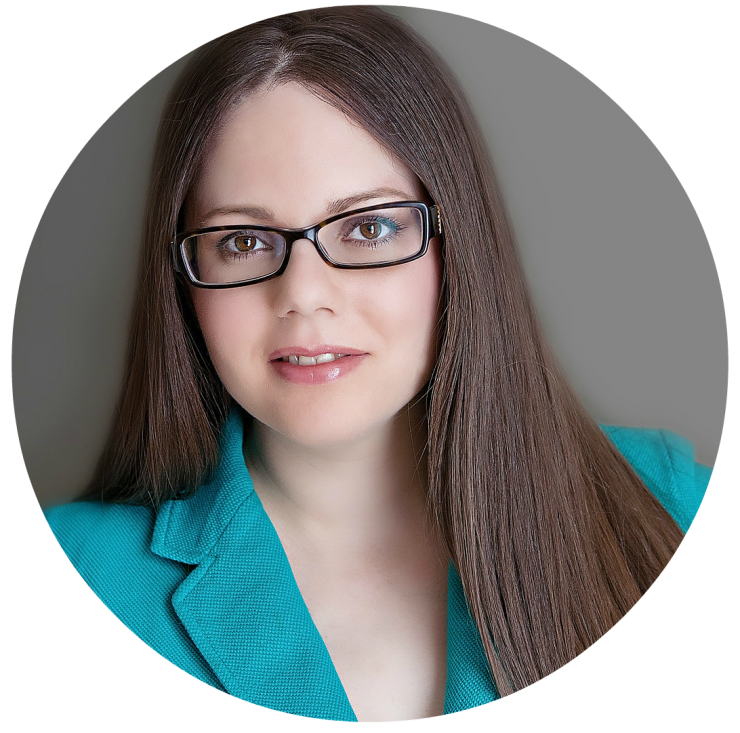 –Beat egg whites in a large bowl with mixer at high speed until foamy. 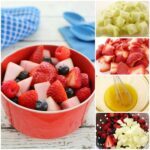 -Gradually add sugar and lemon extract and beat until thickened. 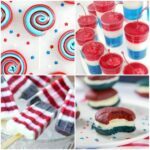 -Add black gel food colouring… stir to blend well. -Tape wax paper covering a cookie sheet . -Using a small pastry bag filled with the black royal icing and a #2 tip. -Using royal icing outline a BBQ grill. -Go over the outline of the grill with the black royal icing to reinforce the icing grill. -Allow to dry for 5-10 hours. -Cut the wax paper holding the completed BBQ grill into squares surrounding the image. -Ensure the grills are dry, gently touch one of the images. 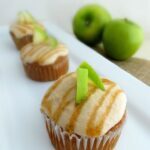 -If the images are dry peel them off the wax paper and place on the frosted cupcake. 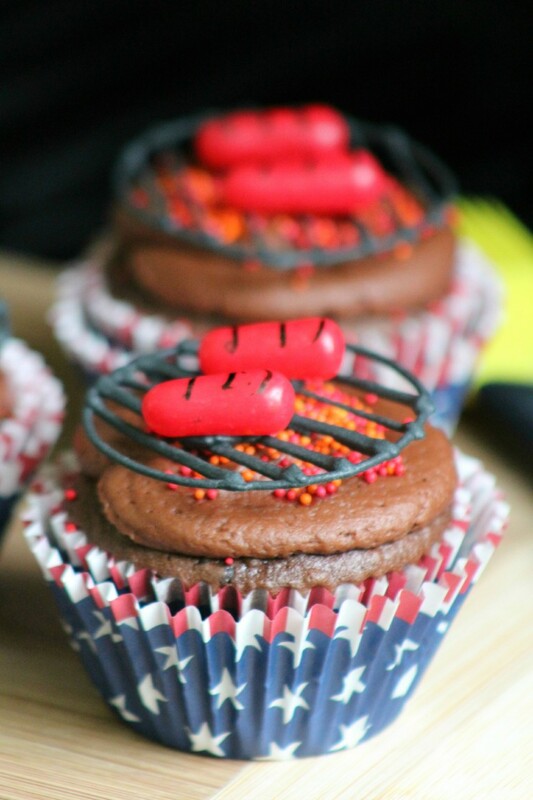 -Draw “grill marks” on each “hot dog” (Hot Tamales) and place on the cupcake. -Mix well... add a small amount of heavy whipping cream after each addition if it doesn't cream until it becomes creamy. -If the frosting is too thick, add more heavy cream, if too thin, add more powder sugar, a ½ C at a time. -Using your fingertip dipped into a small dish of water... wet the frosted cupcake to "stick" your red and orange sprinkles to look like flames. 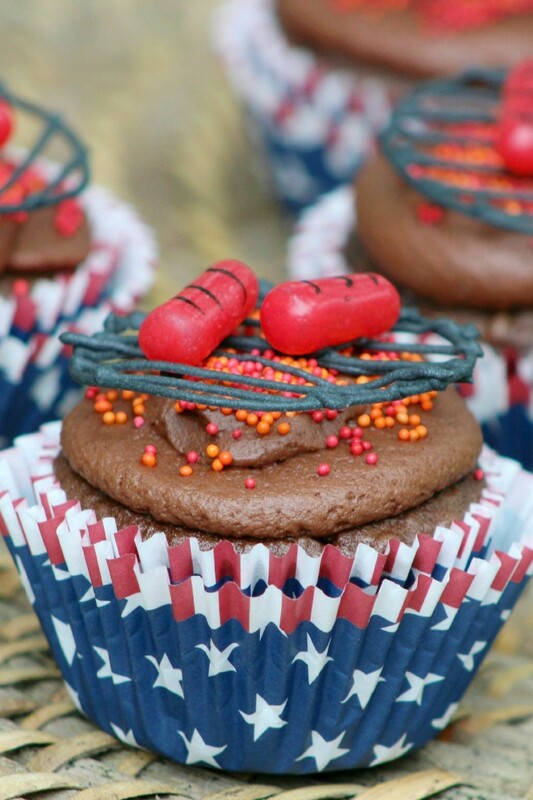 -Draw "grill marks" on each "hot dog" (Hot Tamales) and place on the cupcake. How do you make the grill? It looks like it is stiff and sits above the top, and not all on the cupcake. Please tell me exactly how you did this or do you have a video. Super cute. Want to duplicate. Thx for your time. It looks like black candy melts were used and then piped onto wax paper. Once it cools you can move them around and they will stay the same shape. can you even make these, for a game day tailgate, by substituting, paper liners with football designs, on them?